What have I been loving this week? Hydraluron: Serums are new to me and I have only just added them into my skincare routine. Hydraluron however doesn’t really feel like a serum, more of a extra hydration step in my routine. It claims to penetrate the skins surface to provide lasting hydration from beneath. The result is a more youthful, supple appearance that looks healthy and elastic. It does however feel a little tacky once it’s been applied but after my moisturiser has been applied it feel smooth and hydrated. Topshop Nail varnish in Milkshake: I normally go towards darker shades for this time of year on my nails but as spring in upon us I am hoping that brighter colours on my nails will help me forget that it’s still cold and miserable outside. Topshop’s nail varnishes have a gorgeous finish and formula, this colour is just one of many that I own. Mac Fix +: This has once again made it into one of my most used/loved posts. It’s just one of those products thats suitable all year round, it keeps my makeup in place all day and smells amazing. It’s really refreshing and it helps keep my makeup look glowing and youthful. 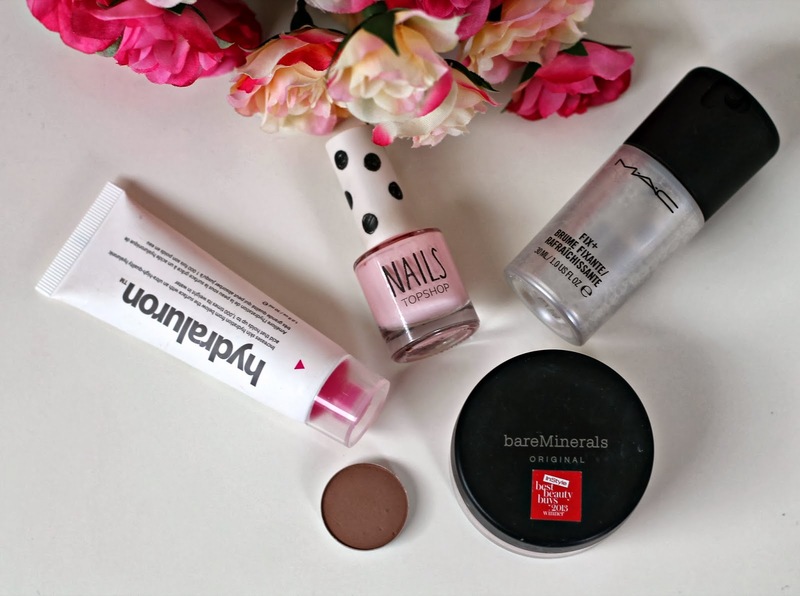 Bare Minerals Original Foundation: In my recent post I spoke about how I’m going to be putting my bare minerals makeup to the test again. I’ve re-descovered my love for this product and I don’t know why I ever stopped using it. It coves all of my flaws, it sinks into my skin effortlessly and creates a beautiful base. I have this in the shade Fairly medium. Omega eyeshadow by Mac: I use this eyeshadow to fill in brows and recently I’ve been loving a natural brow, not to strong but still something there to lightly fill them in. This has been a step in my everyday makeup routine that I just can’t leave the house without. It is a matte finish and it’s described as a soft muted beige-taupe. What have you guys been loving this week?